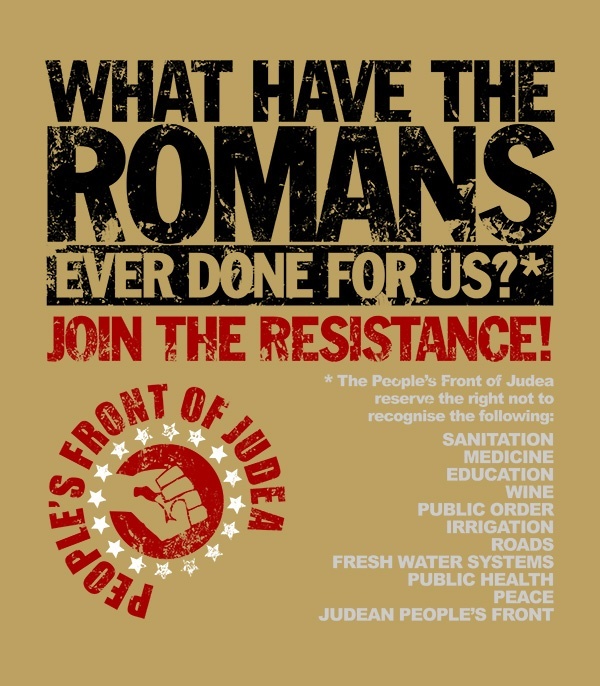 If you've seen the classic Monty Python film, Life Of Brian, you may remember that near the end of it, there was a great scene which features a motley crew of rebels, named 'The People's Front Of Judea' (or was that the 'Judean People's Front'? ), who all sit down in a room together, and complain about what the Romans did for them. 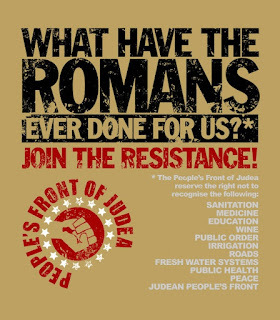 But the thing is, as the scene starts to progress, word by word, complaint by complaint, we gradually figure out that what the Roman's did for them was surprisingly expansive. So much so in fact, that the whole scenario quickly turns into a parody of itself, and basically mocks the notion of why people take on a particular stand against a chosen subject. Now this has got me to thinking: Today, the people of the internet age, tend to click, tweet, and share things over the World Wide Web, while failing to acknowledge how these particular practices can affect us as a society. Once upon a time people wrote letters with pen and paper and then posted them via a carrier service. In today's more modern times, however, we email, we whatsup, we facebook, and we generally shy away from how innovation has changed us over the years. But is this a good thing, or is it a bad thing? One part of me applauds innovation; otherwise we'd all be stuck in caves still trying to make fire. Whereas another part of me is conflicted by it; as I find that progress for progress sake isn't always the most positive force in the universe. 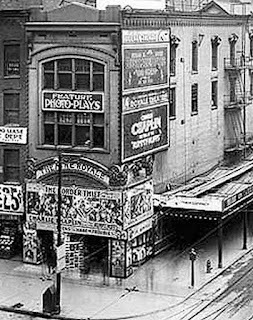 Case in point, back in the 1930s and the 1940s, people had to get up, out of their homes, and travel to 'Picture Palaces' so they could watch a movie or see the news. Nowadays we have TV, Video On Demand, and other services of that ilk, so people normally don't go out as much, which inadvertently makes them less sociable, less adventurous, and less motivated by default. Another factor we have to consider within this equation is how this can affect the younger generation. 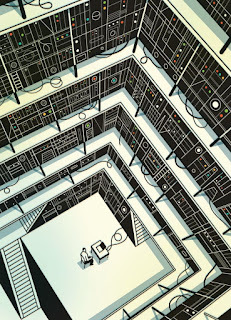 Being brought up in a transitional era, where I saw the rise of the internet, I was fortunate enough to take in what life was like before these things came into play. English TV only had four stations, and some of them weren't always broadcasting. My local cinema, on the other hand, did it's best to show something old and something new, so I grew up watching a pretty good mix of movies. I also visited the library quite often (at least once a week), went to the park (which was close by), and socially things were rather nice across the board. Now I know that some people could argue that social media -- like facebook, instagram, and twitter -- has the ability to bring people closer together, socially I mean, and to a certain degree, yes, this would be true. But in the same breath, if the person who's using social media hasn't been taught how to communicate properly, how are they expected to use it in a responsible and proactive manner? Of course I do mean this with all due respect, as I'm not all doom and gloom where it comes to the internet. Some of the more positive aspects are a marvel to behold: Like how it's improved the lives of people with disabilities, or how it's allowed people who live in remote villages to easily interact with people in large metropolitan towns. You can also click onto a gambling website, like Roxy Palace Casino, knowing full well that your spending habits will be monitored and your best interests will always be taken into consideration.